Here's where to watch every episode of Father Dowling Mysteries season 2. Mouseover or tap an episode to see where to stream it. Click or tap the play icon to stream it on the best available service. The Visiting Priest Mystery Jan 4, 1990 Father Dowling and Sister Steve are taken in by a fake priest. It turns out ""Father"" Damon is actually a hit man sent to kill aging gang-leader, Victor Malko. Father Dowling tries to warn Malko, but he won't take Dowling's warnings seriously. And now the real Father's life might be in jeopardy. The Exotic Dancer Mystery Jan 11, 1990 Sister Steve heads undercover as a crooked card dealer at a high stakes poker game. It turns out the game is really nothing more than a ploy to cover up a robbery. Meanwhile, Father Dowling has his work cut out for him. He has to expose the crime, solve the murder of the exotic dancer and rescue Sister Steve before the card sharks find out her true identity. The Sanctuary Mystery Jan 18, 1990 Sister, Father and a brother find themselves in a life and death situation when Sister Steve's younger brother, Mark, finds himself in the middle of a street gang battle. Someone ends up dead and Mark is the one charged with murder. He points the finger at the real killer, Police Captain Edward Hayton, and then finds himself leading candidate in the role of next potential victim. Father Dowling throws his hat into the ring and finds a case that involves not only murder, but smugglers trafficking in precious gems. The Stone Killer Mystery Jan 25, 1990 Someone is using Father Dowling for target practice and the marksman appears to be an angry ex-con the Father sent up river on a murder rap. Full police protection is offered but how can you run a parish with all those men in blue hanging about? Let alone take part in a charity race. The Woman Scorned Mystery Feb 1, 1990 Is Father Dowling serving up a stew of lechery, larceny and murder? No, it's the work of his evil twin brother, Blaine, who is trying to lure lonely matrons into a phony investment scheme. Father Dowling is forced to masquerade as the wicked brother in a last-ditch effort to prove his innocence and pin the rap on the woman's real killer. The Ghost Of A Chance Mystery Feb 8, 1990 Father Dowling is more than a little skeptical when a young woman insists that her house is haunted. He agrees to investigate just the same after Sister Steve confesses that she has also seen some of the unexplained ""happenings."" Father Dowling concludes that something is indeed amiss, but is it the work of a person or a spirit? The Blind Man's Bluff Mystery Feb 15, 1990 Sister Steve has always been a trusting soul. It's part of her job, of course. So it is no surprise when she opens her heart to a blind man who seems to be in need of assistance. But she soon discovers that she has become an unwitting accomplice in a scheme to blackmail a prominent parishioner. 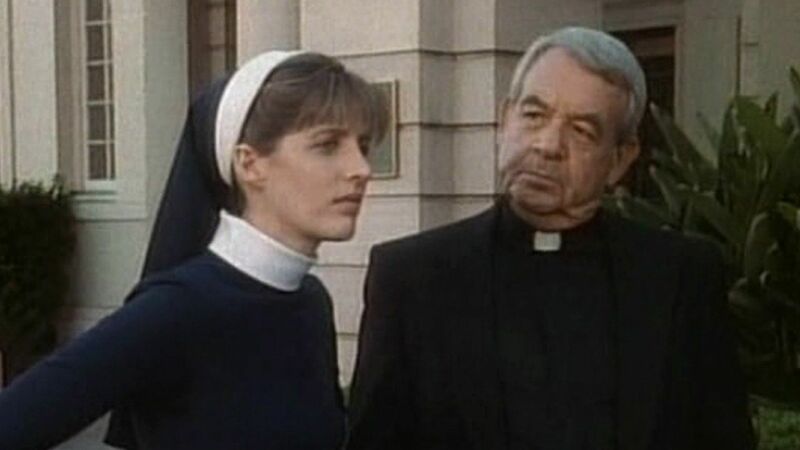 The Falling Angel Mystery Feb 22, 1990 An ""angel"" visits Father Dowling and Sister Steve at the parish and delivers a stern warning that big trouble is hiding just around the next corner. One of the parishioners is about to be ""charged"" with the ""crime"" of guilt by association when it is revealed that his late father was connected with the underworld. The Perfect Couple Mystery Mar 8, 1990 Talk about security clearance. Father Dowling and Sister Steve find themselves smack dab in the middle of a top secret security investigation when one of the parishioners is suspected of stealing confidential documents. The case revolves around a spy who really isn't a spy, a mistress who never was and a cheating husband who didn't. Add to the mix a FBI headquarters that never existed and you've got a case that's about as clear as Irish Stew. The Confidence Mystery Mar 15, 1990 A flim flam con-man has his eye on a valuable church receptacle that Father Prestwick is taking to Romania. He'll stop at nothing to get his hands on the monstrance, even if he has to permanently inconvenience Father Prestwick. It's up to Father Dowling and Sister Steve to put a cap on the con. The Solid Gold Headache Mystery Mar 29, 1990 Sister Steve knows better than to look a gift horse in the mouth, but why would anyone name her as administrator of a six million dollar trust fund? And if you think she is puzzled, the family of the dearly departed are just a tad upset themselves. In fact they are willing to do just about anything to keep Sister Steve away from the fund. And just to show they are serious, they've kidnapped Father Dowling's trusty housekeeper. They've offered to let her go, as soon as someone coughs up mere six million dollars. The Legacy Mystery Apr 12, 1990 Father Dowling has always enjoyed fine art, but someone is going overboard in their role as freelance art critic. A mystery thief is methodically stealing the art treasures that once belonged to the wealthy Cabot family. And Father Dowling has an inkling the thief might be the surviving son, Jonathan. The only question is why would a rich businessman take the risk of stealing the paintings when he could easily afford to buy them outright? And Cabot has perfect alibis for each theft. It looks like it's time for some of Father Dowling's old-fashioned digging for clues. The Passionate Painter Mystery Apr 26, 1990 Suffering for the sake of one's art is one thing, but this temperamental artist's talent might soon be hidden beneath a sad addiction to drugs and alcohol. And that's just the start of his problems. He's just discovered that someone is also trying to kill him.